Ara led the way (with some guidance from Huron) and the companions left the caverns a little after noon. 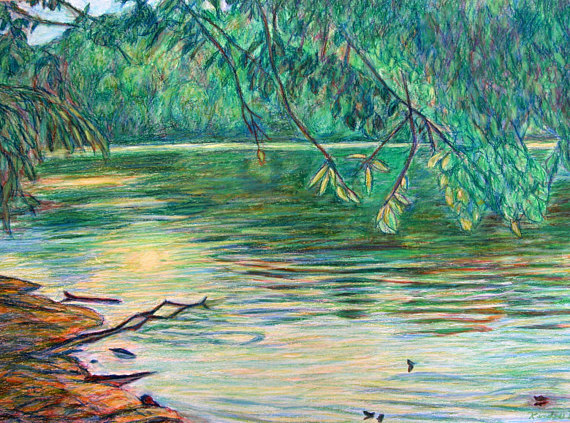 They followed the river eastward. It was a gorgeous day. The party continued their trek towards the ferry. No one else was about. 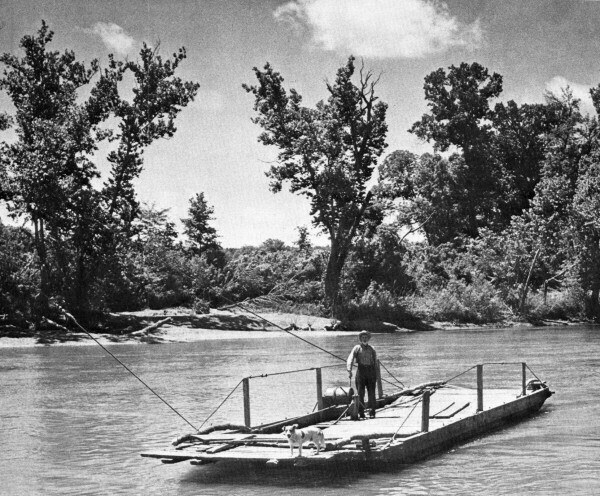 When they came to the ferry, a man and a dog were using it. Leirthal was not impressed however. 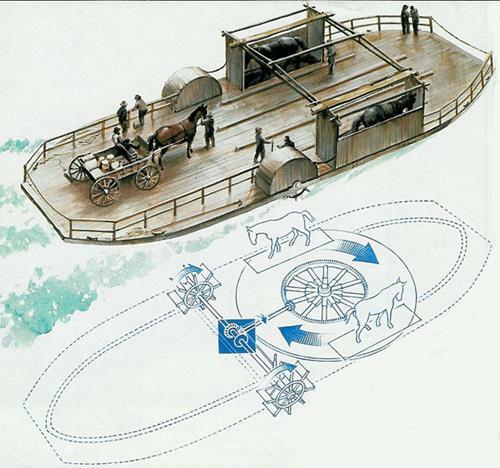 He recalled the advanced technology of the high elves of Winterbole Forest and their impressive horse-powered ferries, which they used for crossing the vast surface of Lake Nen. 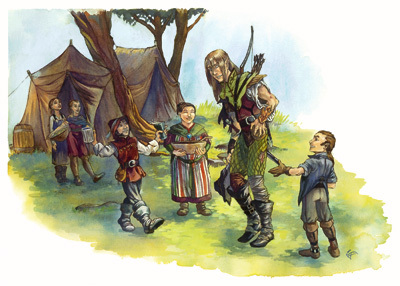 When the party had gone a mile or so beyond the ferry, Ara encountered an encampment of halflings near the river shore. The halflings had been out looking for Huron. Huron was once again reunited with his family and the halflings gratefully thanked the party. They had already heard about the newcomers, from their various spies scouting the countryside. Nok learned that Huron was second cousin to Lorel, the apprentice of druidess Reithann. Afterward, Huron's older brother Wilmo served a mug of ale to each member of the party. *The PC's gain x1.5 bonus XP minor quest reward for delivering Huron back to the Reedfoot Clan. That is enough to garner a +1 level increase. Congrats! 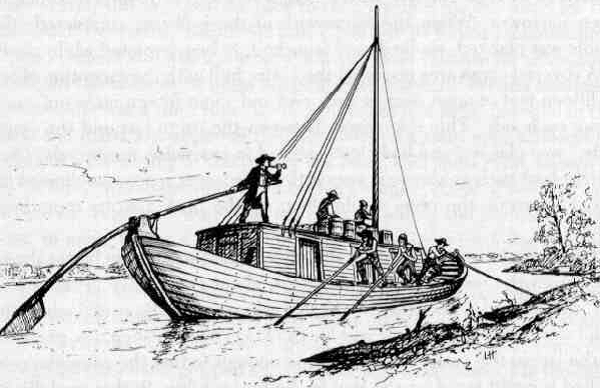 The elder Reedfoot, Willet arrived soon thereafter on one of the clan's keelboats. It pulled up to shore nearby. Willet related some info regarding the state of events in Harkenwold. It was similar to what they'd already learned from Reithann: The people of Tor's Hold would probably rise up, if the threat of the bullywugs could be eliminated. Bran Torsson is known to be an honorable man, but the primary commander of the resistance is Dar Gremath, and he is in Albridge. Meanwhile Baron Stockmer is said to be a prisoner in his own castle, located in the capital city of Harken. That town is where the Iron Circle's presence is strongest. Dolf's Orchard – Liam Dolf is a gnome with savvy business sense. He is friendly to the Resistance. Stonehill Inn - Gladys Kaine, proprietor. She remains neutral about politics, but offers fare rates and clean sheets. 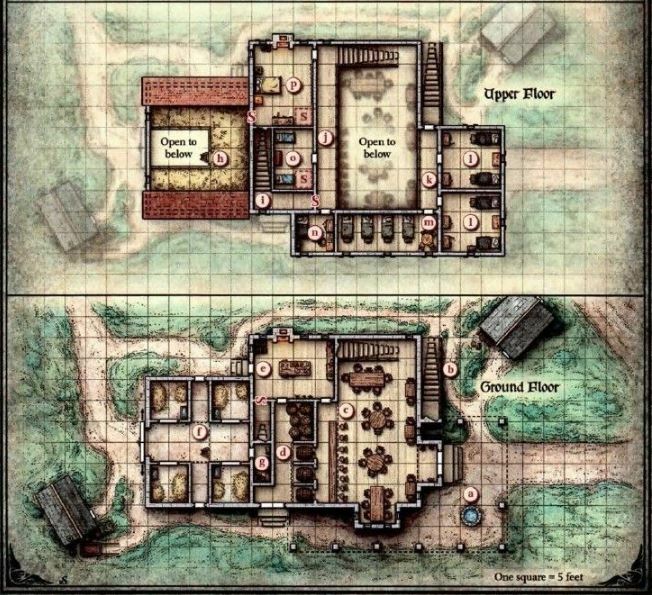 Blue Goblin Tavern – Once a decent watering hole in the Wold, it has recently been taken over by local roughnecks and some members of the Iron Circle. Hall of Tor – The Ancestral home of the community. Sometimes resistance meetings are held there. Lionshield Coster – A general store. The costermonger offers some of the best hard cider in all the Nentir Vale. Goodbody Farm – Dennis and Elaine Goodbody are friendly to the Resistance. Townhall - Closed. No community meetings are allowed by order of the Iron Circle. Saying their goodbyes, the companions headed towards Tor's Hold. With a few more miles under their feet, the party arrived at Tor's Hold around 6pm. There had only been a few other travelers on the road. 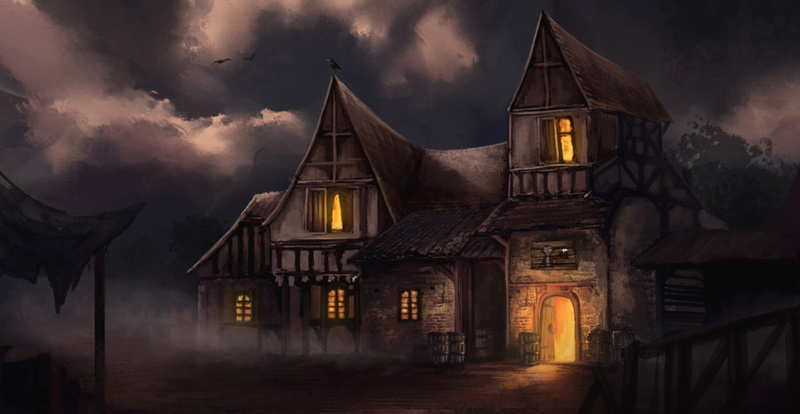 The streets of the hamlet were quiet, though loud voices could be heard from the tavern. A half dozen townies were wandering about. Were we given any idea where to find Bran Torrson? Whitey wrote: Were we given any idea where to find Bran Torrson? Bran is a busy man, but his residence is the Hall of Tor. After a long day's work, he is often known to wet his whistle at the tavern. Bru wonders if it might be a good idea to drop by the inn when they get to Tor's Hold to secure rooms and clean up before checking out the tavern. Perhaps Gladys can offer some insight on the local roughnecks and IC member around town. The orchard also seems like a wise stop for Intel, potential allies, and...apples! Robyo wrote: Nok learned that Huron was second cousin to Lorel, the apprentice of druidess Reithann. Afterward, Huron's older brother Wilmo served a mug of ale to each member of the party. Nok stopped listening after this wonderful bit of news. He sipped his ale day dreaming of Huron regaling Nok's bravery to Lorel. Nok remained lost in his thoughts while walking to Tor's Hold...... Maybe Huron could be their best man at the wedding? The Redfoot elders would surely approve of Nok now. Leithral could be the minister! Is he a minister? Surely, he must be for he is so wise......"
All this fantasizing has given Nok an appetite. He approves of the tavern! Nok steps proudly to the front of the party, elbowing past Ara who has been leading them through the woods. "We are in my turf now." Ara leans over to Nok and says "All right captain, lead on. To the inn just long enough to get rooms, refresh and head to the tavern for food, drink, and as much information as we can ease out of the folks around here." "Gentlemen, should we consider entering the inn and tavern in 2 smaller groups so as to cover each other reduce the amount of pressure a group like ours might present when arriving all at once?" trouble7332 wrote: Ara leans over to Nok and says "All right captain, lead on. To the inn just long enough to get rooms, refresh and head to the tavern for food, drink, and as much information as we can ease out of the folks around here." "Gentlemen, should we consider entering the inn and tavern in 2 smaller groups so as to cover each other reduce the amount of pressure a group like ours might present when arriving all at once?" Nok pretends not to listen, so as to maintain the appearance of being in a charge. Nok casts a quick glance at Leirthal to make sure he sees what a good job he is doing. Nok is satisfied that Leithy is only pretending not to watch him, so as to to better keep an eye on him. Nok is truly grateful for Ara's discretion, as he wasn't paying attention to the plan in the slightest. Visions of fair Lorel danced in his head and as Brandobaris knows, Nok can only keep 1 thing in his mind at a time. Nok leads the party down a series of back alleys. He pauses, listens, and darts about the shadows with great theatrics. Somehow, the party still arrives at the Stonehill Inn making good time. 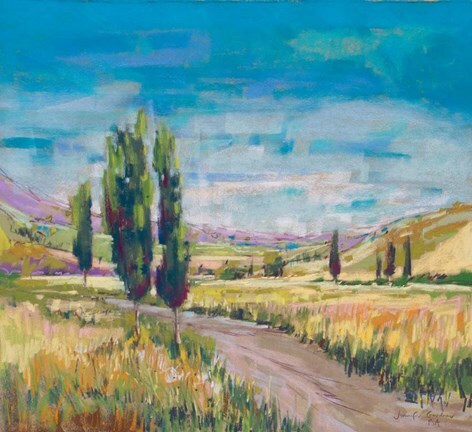 Bru nods and looks towards Drusus with his arm held out as if to defer the lead. "You can do the talking. I'll play dumb." Ok, so the party checks into the Stonehill Inn. There's currently available: 2 rooms with 2 beds each, 1 room with 2 small beds, and a room with a single bed. The room with 4 beds is currently occupied. How many rooms at the inn do you want for the party? Inside the tavern, there are still 2 open tables and one open stool at the bar. There are a half dozen patrons inside, seemingly drunken and carousing. Also wondering if everyone has leveled up yet? I say 4 rooms. Bru's probably gonna need his own. Cyc is leveled up. Leirthal has been picking up on the patterns in the magical energies in the Spells of his companions. He has also been incubating some research in his spell book and in his fey heritage. He has learned 2 new spells and a cantrip as well as another spell from the fey teleportation feat. +1 int. and increased hit points. Leirthal adds a caveat to the plan before the group enters the inn. "I need some time to research. The tavern will be there later in the evening. You ruffians should bring your plundered items for study as well." Once in his room he will cast identify as a ritual. "Quiet," he shushes with a whispered rebuke. "This is powerful magic; do not distract me." Quxx is keeping an eye for signs of fellow "factions agents". As a faction agent, you have access to a secret network of supporters and operatives who can provide assistance on your adventures. You know a set of secret signs and passwords you can use to identify such operatives, who can provide you with access to a hidden safe house, free room and board, or assistance in finding information. These agents never risk their lives for you or risk revealing their true identities. 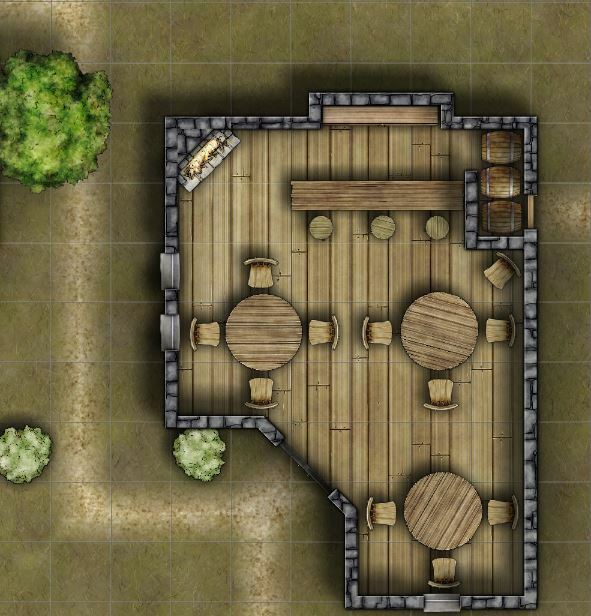 DM: the inn has a communal area where food and drink are served I'm assuming? Would this area be adequate to view the doors to the rooms? If so, Bru would invite the others to join him for a meal after cleaning up where they could keep an eye on Leirthal's door while he does his work and take in the atmosphere a bit. Map posted for ease of use. Please state which room your character is staying in. Communal room is on the first floor (C). The available overnight rooms which the party checks out are: L, N, and O. Rooms M & P are occupied. A bed for the night costs 5 Silver Pieces. It is a modest inn. Meals are only served in the morning 8-10am, prepared by Gladys. She explains that they used to have more meal times, but the head cook lit out of town with his family two weeks ago. His home on the outskirts of town had been harassed by bullywugs. She only has a few part time employees now, and one girl just quit on her yesterday. Leirthal spends some time enacting the ritual of identification. ~The black metal armor glows red when violence flares. +1 black iron chain mail. As a Reaction, when a foe hits you with an attack, the enemy takes -2 penalty to attack rolls. Wisdom save DC 13 drops the effect to -1 penalty to attack rolls. Another Wisdom save (DC 13) to nullify the effect. You must complete a Long Rest to use this power again. Requires Attunement. ~You can unleash a clap of thunder when this weapon hits, carrying your foe away on a wave of deadly sound. +1 thundering maul. Once daily, when you hit with this weapon, deal an extra 1d8 thunder damage and push the target 5'. Requires Attunement. ~This simple potion draws on the body's natural healing ability to cure your wounds. Potion of Greater Healing, 4d4 +4 HP regained. ~This quarterstaff of bone channels the madness of the elder gods of chaos. Staff of Gloorpk. Dragonfang Bolt: Targeted creature WIS save DC 14 or suffer 1d10+4 Poison damage and all creatures adjacent to target take 3 Poison damage. Electric Reflux (Recharge: 4-6): Ray, Targeted Creature DEX save DC 14 or take 4d6 Lightning damage. Fiery Croak (Recharge: 6): Cone 30', Targeted creatures CON save DC 14 or take 4d10 Fire and Force damage on a failed save, or 1/2 damage on a successful one. Requires Attunement. "I care nothing for these other trinkets. You brutes may squabble over them. This staff... It's magic is... Twisted. I must do more research... But later." Leirthal will take room N.
"Watch who you call a brute, small one"
There are 2 room Ls, but Bru will make himself at home in the one nearest to the stairs if it matters. There's another bed for anyone who wishes to share. The bed is a bit too short, as are most, but he is used to his feet dangling off. A few drinks will insure his rest is adequate. "But.... but.... I am hungry now." Nok gives Gladys his best sad puppy face from his days as a street urchin. "Killing all those bully wugs, Gloopy and rescuing the boy from the big ugly one got my tummy all empty. I can even prepare it myself and pay for the ingredients!" Nok isn't yelling, nor making any efforts to be subtle. He is just hungry. Now. Leithy was too busy looking at his magic stick to make a proper supper. Nok will share a room with Leithy as usual. Leithy always pays. Chris wrote: Nok will share a room with Leithy as usual. Leithy always pays. Room N only has a single bed in it. Leithy called it first. Room O has the small beds. So it sounds like the party is crashing for the night? You've already postponed the trip to the tavern, but the Blue Goblin is open late. Your characters were offered a meal by the Reedfoots, but that was a roughly 6 hours previous. Once the companions have checked into the Stonehill Inn, identified the magic items, and so on, it's now nearing 8pm. "What's the plan here, gents? Seems we've gotten our rooms and had a bit of time to settle in, but Nok seems to have a grumble belly and I could go for a bite as well. What say we head to the tavern to see what's going on in there?" He continues, "I like what you said earlier about going in as seperate groups to not draw so many looks, Ara. Do we pretend to be strangers in there?" Lastly, he considers the Iron Circle cloaks they gathered back at the homestead. "I wonder if we would be able to pass as new recruits of the Iron Circle? It would be good if we knew more about their structure, dont you think?" Room N is fine with Nok. He likes sharing a bed, keeps him warm. Leithy must like cuddling too or he would have chosen a room with 2 beds. Chris wrote: Room N is fine with Nok. He likes sharing a bed, keeps him warm. Leithy must like cuddling too or he would have chosen a room with 2 beds. "You will sleep in the wee folks room with the Dwarf." 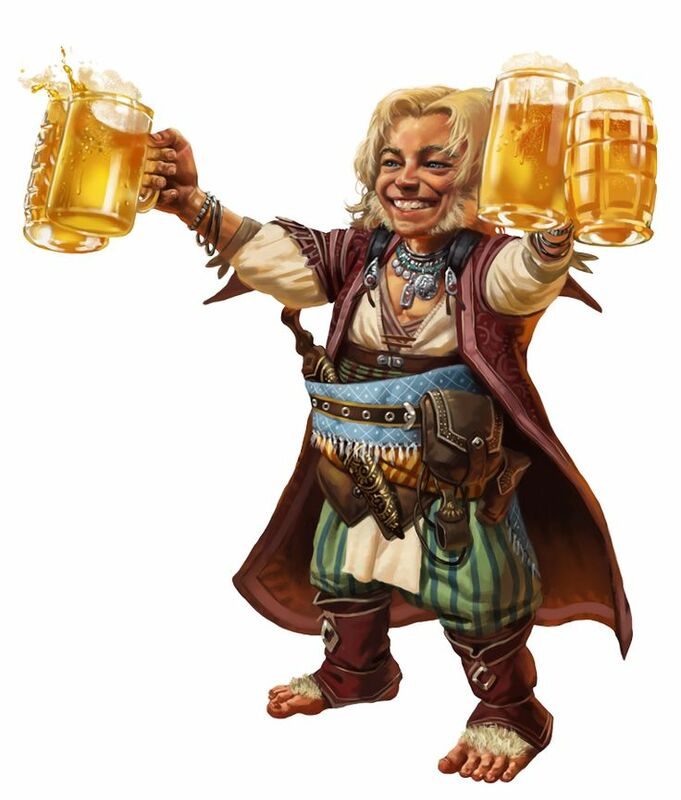 After Leithy closes the door in his face, Nok shuffles his feet down to room O. Nok doesnt sulk for long however, he recalls Bru talking about going to the tavern. Nok agrees with any plan that involves drinking. GM - I must assume that no faction agents have been spotted as per my previous post? "Let us spend the evening collecting information, get a good night's rest, and decide on a course of action in the morning." MAS wrote: Leveled up and ready. Since Faction Agent is your character's background, maybe there should be some explanation about it in the character thread? What faction is it? What is their goal? What did Quxx do for them? How long did he serve? As it is, I know NOTHING about Quxx's background or alliances. So randomly dropping Faction Agent contacts into the adventure doesn't make much sense to me. Whitey wrote: Cyc’s happy to bunk in the room of 4 along with whoever from the party cares to join him. Room M (4 beds) is currently occupied by a group of travelling fishermen. "The wee folks room is over there," Leirthal points. "Let's off to dinner now, what's taking you all so long?" I was presenting an opportunity for roleplay, collaborative worldbuilding/storytelling and a possible way to gather information regarding the storyline. Nevermind. Cyc will bunk in one of the L’s. I'm happy to collaborate, but we need something to work with. Maybe start building it in the character thread? You have all of the campaign world info, I don't know what is happening so I can't exactly come up with campaign world info. Hence me looking to the GM for a prompt to improv from. But again, forget it, its not important. A character's back story is not essential, but I feel it is important. The Blue Goblin has a welcoming, if weathered, vibe to it's establishment. It sits away from the road a bit with a large stables and a small taverner's house situated around back. 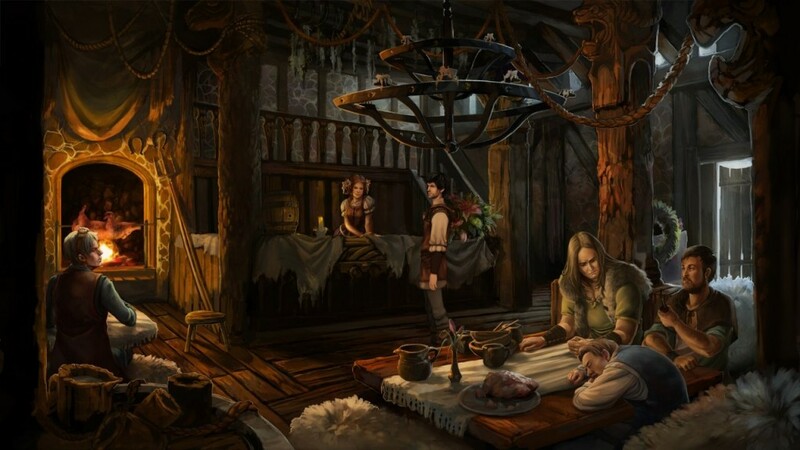 The companions enter the tavern shortly after 8pm. There are several other Harkenwolders (including the barmaid and the taverner) inside the premises. The folk are generally dressed in peasant attire. They mostly keep their heads down. One of the patrons leaves shortly after the companions arrive. Then another follows soon afterward. A warm hearth glows in the corner. A few pairs of eyes view Bru suspiciously, particularly the iron circle cloak which hangs from his wide shoulders. A comely barmaid with a bright smile approaches the table. "My name's Marya " She looks the crew up an down. "You all are packing some steel. That's alright, but some folks might not appreciate it. Still, every stranger that arrives must sing to be served some brew. If you're hungry, the special tonight is roast goose with apple sauce." The party takes their spots at two of the tables, or at the bar if they prefer. The table closest to the door (south of the map) is occupied by rugged patrons. Comes from the Green Dragon!! Marya laughs with glee. "Oh, thank you! I haven't heard that one in awhile. What do you want to drink, master halfling?" Robyo wrote: Marya laughs with glee. "Oh, thank you! I haven't heard that one in awhile. What do you want to drink, master halfling?" "A round of your house ale for the table, please, followed by a roasted goose with another ale, then maybe another goose and some more ale, please. And thank you, I am very hungry." Bru smiles widely at Noks gracious order. He reaches down to his belt and plucks forth 3 gold pieces to offer Marya. ""Make that a round for the house, if you please. Nobody here wants to hear me sing." When she does her deliveries, he will clock the room to gauge the response of the patrons. Leirthal parsimoniously doles out the necessary change for food and water. He is afraid that others might expect him to reciprocate the round for the house.